-Govt activities to be founded on six fundamentals to achieve "Prosperous Nepal, happy Nepali"
KATHMANDU, March 28: Prime Minister K P Sharma Oli has said that all the activities of his government shall be founded on the six fundamental pillars for achieving the motto of “Prosperous Nepal, happy Nepali”. 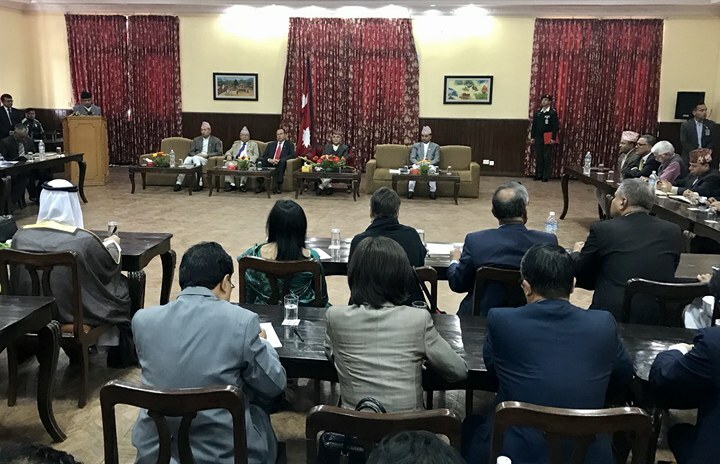 In his remarks to Kathmandu-based diplomats on the major policies and priorities of his government at a luncheon Tuesday, Prime Minister Oli said the pillars of his policies and programs shall be nationalism, territorial integrity and national independence, and th efulfillment of national interests. He described nationalism as the protection of sovereignty. “Pursuit of national interests and fulfillment of international obligations go hand in hand. This comes as a non-negotiable priority for us. We will serve this cause on the basis of our values, realities and aspirations,” the prime minister said. The prime minister mentioned that sustainable peace and prosperity based on equality and stability, progress and development are two other pillars of his government's policies and programs. “We have learnt hard lessons from our own experiences what the price of instability would be. Any attempt to undermine peace and stability will not be tolerated at any cost and will be dealt firmly and resolutely,” he said. During the luncheon meeting at his official residence at Baluwatar coordinated by the Ministry of Foreign Affairs (MoFA), the prime minister also mentioned that the new government had a strong commitment to good governance and this would continue to guide the policies, programs and activities of the government. “With an end to the protracted political transition, the exclusive focus of the government now will be to fulfill people's aspirations for broad-based, inclusive and sustainable development,” he said and also spoke of his resolve to overcome the vicious cycle of poverty. On foreign policy priorities, Prime Minister Oli said that promoting the image of Nepal at the international level as a State that is practicing comprehensive democracy as well as advancing Nepal's cause of socio-economic development will remain the priority of his government. The overall engagement of the government with other countries will be directed by the principles of Panchsheel, non-alignment, the UN Charter, international law and the norms of world peace, he said. 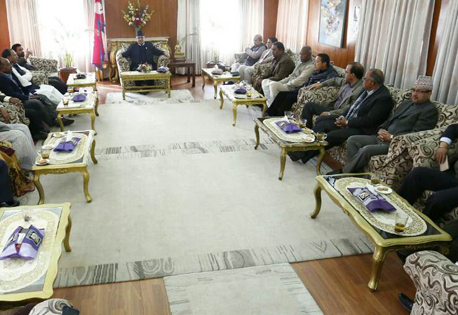 Prime Minister Oli also said the motto of his government shall be “amity with all, and enmity with none”. Arguing that development imperatives at home will be the guideposts for diplomatic engagements abroad, the prime minister further said that building Nepal's image as the land of diverse and bountiful resources will be the goal of the government. On neighborhood policy, Prime Minister Oli said Nepal enjoys cordial and friendly relations with both immediate neighbors-India and China. While stating that mutual trust will be the key ingredient of Nepal's relationship with the immediate neighbors, the prime minister said that the new government wishes to enhance relations with all other friendly countries in Nepal's extended neighborhood. Prime Minister Oli also said that the new government will work towards enriching the substance of cooperation in bilateral engagements with major powers and development partners. “Given the level of our development, we still need an enhanced level of development cooperation mainly for economic development. We urge the development partners to align assistances with our priorities,” he further said.